금동으로 제작된 관음보살상이다. 관음보살은 부처의 자비로움을 상징하는 보살로서 중생들이 이름을 외우기만 해도 고통으로부터 구제된다고 한다. 머리에는 높직한 보관(寶冠)을 쓰고 있으며 보관의 정면에 관음보살의 징표인 작은 부처 1구가 새겨져 있고, 왼손에는 정병(淨甁)을 들고 있다. 얼굴은 약간의 손상이 있으나 원만하면서도 입가에 미소를 머금고 있어 조용한 가운데 자비가 넘치고 있다.신체는 발달한 가슴 잘록하고 유연한 허리, 늘씬한 하체 등으로 인하여 우아하고 세련된 조형성을 보인다. 목걸이에 달린 장식과 어깨에서 발까지 길게 드리워진 구슬장식이 함께 어울려 보살을 더욱 화려하게 만들고 있다. 물결치듯 흘러내린 옷자락은 U자형의 옷주름과 함께 생동감을 더하고 있다. 이 보살상의 가장 큰 조형적 특징은 허리를 약간 비틀고 있는 삼굴(三屈)자세로, 통일신라 불상의 특징을 잘 표현하고 있다. 몸 위에 걸쳐진 화려한 장신구들과 삼굴자세는 불상조각의 극치를 이루고 있다. 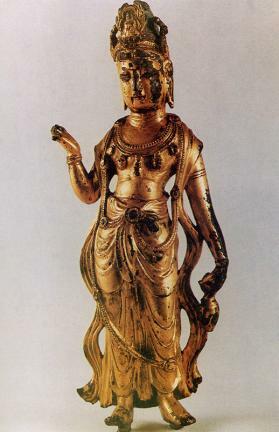 This is a statue of Avalokitesvara, a bodhisattva symbolizing the mercy of the Buddha. People are said to be able to attain salvation by just memorizing the name of this bodhisattva. He is wearing a high jewel crown, with one small Buddha statue, which is a symbol of Avalokitesvara, carved on it. He is also holding a kundika, a kind of ritual bottle, in his left hand. The face is impaired in part, but the well-developed body and smile on the face create a calm, merciful atmosphere. The top of his body is bare, but the slim waist makes the chest look more voluptuous. The ornaments on the necklace and a bead decoration from shoulder to feet make the statue more splendid. The drapes and pleats of the robe add a feeling of movement as well. The most specific formative characteristic of this statue is the posture – the waist is a bit twisted, which deepens the voluptuous and sensual figure, showing the typical characteristics of Buddha statues made in the Unified Silla Period. The magnificent ornaments and posture express the essence of the Buddha sculpture to the hilt.